Jenn and I have reviewed a lot of Puma in these parts. In fact, when I went searching for previous Puma posts (triple-P alliteration for the win!) I discovered that I’m still rocking these Puma capris on the regular — five years later! (I even ran around the house hunting them down to ensure they were indeed the same; we take journalism and accuracy seriously here, folks!) So, of course, I was game to test out some new cross-trainers that have now worked their way into my shoe rotation. I’ll admit, I was skeptical at first. … so pretty that I’ve gotten loads of compliments on them, from attendees of the PowHer event to my OB/GYN (now, if that’s not an endorsement, what is?). While pretty is nice, how did they perform? As cross-trainers, they’re definitely not meant for running — they lack the cushion, heft and support I like in my running shoes. But for activities like cycling or Zumba or really almost any other non-running activity? These are gems. They’re so lightweight and flexible that you really feel like they move with your foot, not against it. While my feet felt supported, I will say that these took some getting used to, as the features that make it really light also feel really minimal on your foot. The sole is really flexible and bendy, like no other shoe I’ve ever had. 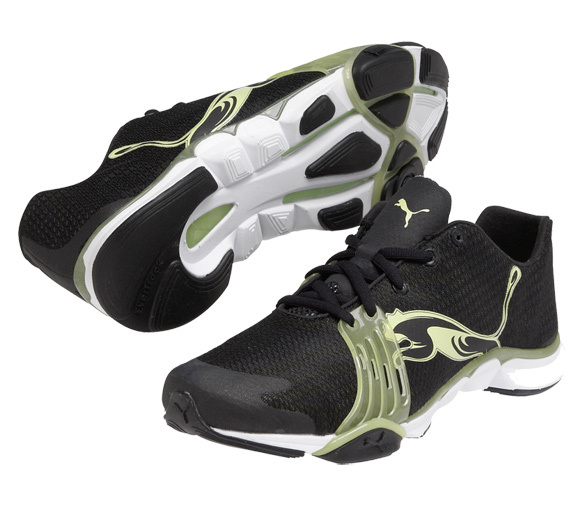 The mesh upper is super thin and breathable, so your feet won’t go overheating with these. And the band that gave me pause? I didn’t even notice it once I had the shoe on. 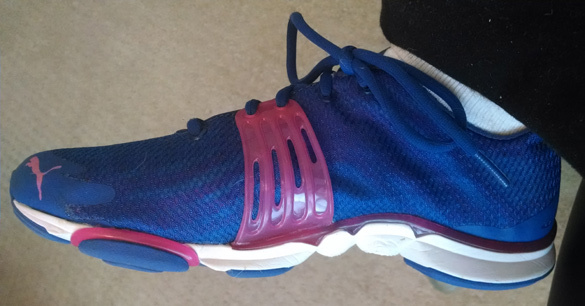 If you’re looking for a shoe that will help you feel quick and agile for a kickboxing class or ones that will give you support but let you quick-step in an aerobic dance class, try the Mobium XT on for size. It’ll make you feel quick like a bunny (or a cat) and look pretty cool while you’re at it! Thanks for sharing, Erin. A salesmasn told me that it is recommended to buy Puma Mobium XT one size smaller than normally worn running shoes (or even regular sneakers). Do you agree with this opinion? My second question is – did you try to use them sockless? Just curious.